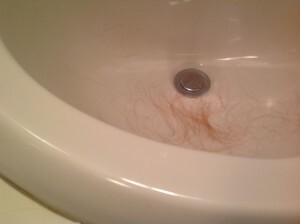 Well, I thought my hair would start to go after the second chemo session, as that seems to be the general experience. I’d been checking every single day by brushing and experimentally tugging slightly, to no result whatsoever. Business as usual, my hair said to me, don’t worry about us. 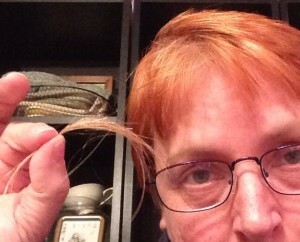 In fact, we could use a trim! OKAY BOYS, PACK IT UP, OUR WORK HERE IS DONE! My response: hilarity. I found it funny as hell. I’m not entirely sure why. Sure, I knew it was gonna go. But now? 10PM? The night before my second chemo? And not 6PM, because I checked, nope. 10PM. Not a gradual thinning, but an apparently unanimous decision. Not that it dropped off all at once, but any time I gave a slight tug, I got a bunch. Each and every time. If I’d kept tugging, I’m pretty sure could have plucked myself bald, right then and there! When I collect enough, I’m going to knit myself a kitten. I think it was the spontaneity and the unanimity that got to me. It’s like they held a referendum. So, I’m pretty sure that sometime today or tomorrow I’ll do the pre-emptive strike. But first: find a hat! In other news: Still looking in to getting the ebooks out on other platforms. It’s a longer process than Amazon Kindle. But I’m going to try like the dickens to get The Outskirter’s Secret out at least on Kindle by, say, Sunday. Well, think I’ll take a nap. I’m at Chemo at the moment, and loving my iPad with Logitech keyboard allowing me to blog and write and all right here, right now. Everyone else is either watching skanky daytime TV on the overhead screens, or talking on their phone, or dozing, or generally looking bored and unhappy in various ways. Hey, Hugo awards nominations are open! No, I’m not eligible this year, but my pals Delia Sherman and Ellen Kushner are, in the Dramatic Presentation category for the excellent illuminated audiobook of their THE FALL OF THE KINGS, about which I have enthused before at length. So, if you are a WorldCon attendee, please do consider voting for them.